Hong Kong is one of the most prosperous insurance markets in the region. There is a strong demand for professionals in insurance companies and related regulatory bodies. Our programme aims to develop students’ ability to apply blended skills in statistics, business and computing to design, analyze and manage insurance products. Students are prepared for taking up professional roles in the back office of insurance companies such as actuary, underwriter, and claims officer upon graduation. Written test and interview will be conducted on a case-by-case basis. BSC-AIN programme adopts a Best Five Subject Policy with English and Mathematics inclusive. The applicant’s HKDSE subject scores are first multiplied by a subject weight. The admission score is the sum of the five highest weighted scores. For students with the same admission scores, consideration will be made on a basis of other available information including band choices, interview performance, OEA, SPN, etc. *Remarks: Applicants must fulfill programme’s minimum entrance requirement (i.e. Core 5 excl. M1/M2: 33322). 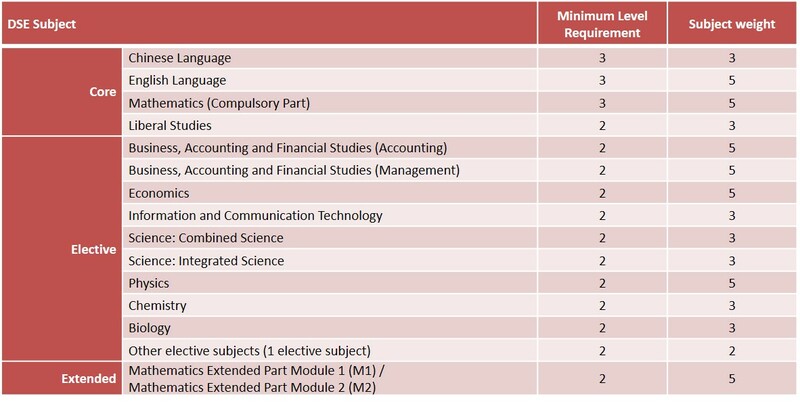 The minimum level requirement of HKDSE subjects are shown below. There are three levels of subject weight (2, 3, and 5) to calculate the weighted score. Admission score is the sum of the best five weighted scores of an applicant’s HKDSE result. The weighted scores, which are the level attained of a subject times the corresponding subject weight. Take the following table as an example, the best five subjects in terms of the five highest weighted scores are Chinese, English, Mathematics (Compulsory), M2 and BAFS (Accounting). These five subjects will be used to calculate the admission score.